Zola wont reveal how he does his tricks; that would be breaking the magicians code. But as the new director of Emorys Yerkes National Primate Research Center, a role he assumed in September, he means to lay all his cards on the table. 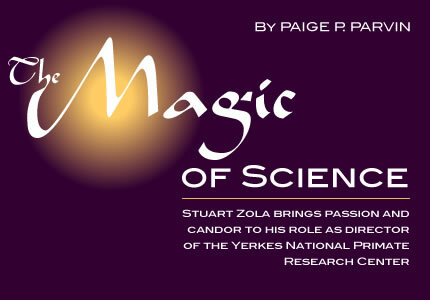 One of Zolas top priorities for Yerkes is to develop a more open, positive relationship with the public, swapping scientific patter for straight talk. He believes he can better serve the center and its work by offering outsiders a window onto the process of scientific researchincluding the aspect that has turned both Zola and Yerkes into lighting rods for controversy: the use of animals. Zola is a man driven to understand how things work. 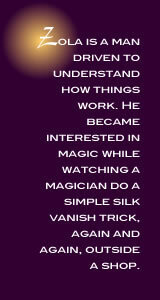 He became interested in magic while watching a magician do a simple silk vanish trick, again and again, outside a shop. Zola thought, I know about the brain. I can figure this out. After watching the performance some thirty times, he was amazed to learn that it was easy, a mere trick of perception. To say Zola knows about the brain is an understatement. He has studied its structure and function for more than thirty years. Much of his research has involved monkeys, a practice that has exposed him to vociferous criticism from those who oppose such experimentation. Repeated encounters with animal rights activists have led Zola to become an outspoken supporter of research and the critical role of animals in scientific progress and lifesaving medical developments. He speaks with conviction about the value of clear, candid, and continuing communication between scientists and the public, a fresh approach in a field often assumedlike the performance of magicto be shrouded in mystery and complexity. Zola brings his philosophy of openness and edification, along with his renowned contributions in the field of neuroscience, to Yerkesa research facility whose scientific reputation has been inextricably linked with conflict over its use of animals for medical research. My sense is that scientists have a new part to their job description, to educate, explain, and counter the misinformation that can be damaging to our work, Zola says. It is clear we need to take the initiative ourselves, to be proactive rather than reactive. Still a relative newcomer to Yerkes and Emory, Zola says he was drawn tothe sense of genuine excitement and heady ambition that has propelled work at the center in the last few years. Before he paid a casual visit to Yerkes two years ago with former director Thomas R. Insel, Zola had no plans to leave his post in the psychiatry department at the University of California at San Diego, where he had spent most of his career conducting research and teaching. Zola also was a research career scientist at the Veterans Administration Medical Center in San Diego and earned masters and doctoral degrees in neuroscience from Northeastern University in Boston. In his new role, he holds titles as professor in the Department of Psychiatry and Behavioral Sciences at Emorys medical school and research career scientist at the Atlanta Veterans Affairs Medical Center. Most of his days are spent at Yerkes. 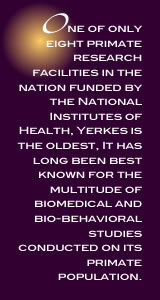 One of only eight primate research facilities in the nation funded by the National Institutes of Health, Yerkes is the oldest, founded in 1920 by Yale scientist Robert Yerkes. In 1930, the Yale Laboratory for Primate Biology was packed up and moved from chilly Connecticut to a climate better suited to primates, Orange Park, Florida. Emory bought the laboratory in 1956, then moved it to Atlanta in 1965. Yerkes has long been best known for the multitude of biomedical and bio-behavioral studies conducted on its primate population. When Insel took the helm in 1994, the center broadened its scientific scope, setting its sights on breakthrough medical discoveries and advances that will more directly benefit human health. Under Insels leadership, Yerkes affiliated itself with four focused research centersthe Vaccine Research Center, the Center for AIDS Research, the Center for Behavioral Neuroscience, and the Living Links Center, which concentrates on evolution studyand began working more closely with Emorys Health Sciences Center. In 1999, Insel stepped down to head the new Center for Behavioral Neuroscience, choosing to focus his leadership in his own field of research. Now Yerkes is poised to offer a potentially successful AIDS vaccine, a treatment for cocaine addiction, a new therapy for Parkinsons disease, and cutting-edge technologies to combat cardiovascular disease, as well as scientific findings that will increase our understanding of memory, vision, aging, evolution, and the brains relationship to behavior. It is a moment ripe with possibility. 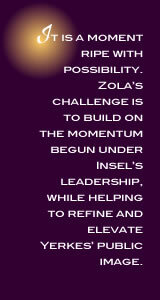 Zolas challenge is to build on the momentum begun under Insels leadership, while helping to refine and elevate Yerkes public image. Such a balancing act requires clear-headed vision, sure leadership, and a genuine devotion to scienceand some days, a little magic wouldnt hurt. Zola also shares with his colleagues a born passion for scientific discovery. Each day he walks through the Yerkes laboratories, keeping abreast of various research projects. The labs, some of which line the perimeter of the three-story Yerkes main building, are interconnected to encourage conversation and collaboration among the centers fifty-two faculty scientists. Each brightly lit room is filled with the sorts of works-in-progress one might expect to find in a research laboratory: trays of vials filled with liquid, slides under microscopes, computer printouts, humming machines. There are also house plants on the windowsills alongside framed school pictures of the researchers children. Its a striking juxtaposition, making the scientific process of, for example, identifying the brain chemicals triggered by cocaine seem both mysterious and surprisingly routine. Zola has experienced that joy in his own work on human memory, a lengthy and exacting process that has yielded his most notable findings. Using monkeys because of the similarity of their brain structures to humans, Zola has experimented by administering cognitive memory tests, then surgically removing portions of their brains and testing the monkeys again to see whats missing from their memories. In this way he has made significant progress toward mapping out the human brains intricate memory systems, in hopes of better understanding the memory failure that accompanies conditions such as amnesia, traumatic head injury, Alzheimers disease, aging, and depression. The study of humans with such memory problems has provided an equally important complement to his research. At Yerkes, Zola has the chance to both draw upon and enhance the work of other researchers who are studying the brains more elusive functions, such as perception and emotion. He believes strongly in the value of scientific cross-pollination. The groundbreaking work being done in the area of immunology, for example, may be more closely connected to ongoing research in neuroscience than scientists have previously realized. Studies conducted in the Vaccine Research Center suggest that cells that fight infection may actually remember how, through a process similar to the way the brain remembers how to tie shoes. In addition to the development of vaccines that could potentially save millions of lives, critical projects at Yerkes include a possible medication for cocaine addiction, which doctors hope will work in much the same way methadone helps heroin addicts; medications for Parkinsons disease that would target specific receptors in the brain, reducing or eliminating the negative side effects of current therapies; and new treatments for cardiovascular disease, complex vision problems, and organ transplant recipients struggling with rejection. Each of these efforts is underscored by the work of other Yerkes scientists seeking to more thoroughly understand the neurological basis for myriad behaviors and functions; in other words, how our brains tell our bodies what to do. One common denominator in all these projects is the use of animals. The federal government requires that most new medical treatments, including drugs and vaccines, be tested in animals before humans, but that is typically one of the final steps in a long journey. Using an astonishing range of research techniques, scientists look to animals first to help them identify what to treat and how to treat it, an intense process that can take many years of study. Typically, experimental treatments are tested first in rodents, then, if warranted, in monkeys, then finally move to human trials. On principle, researchers use the lowest order and the smallest number of animals they can in any given study to achieve the necessary results. To that end, Yerkes houses about three thousand apes and monkeys, at both the twenty-five-acre main station at Emory and Yerkes 117-acre field station in Lawrenceville. The vivarium at the main station also holds some two thousand mice and other rodents, many of which have been genetically engineered and manipulated to imitate specific human biological systems or conditions. The most common species of primate at Yerkes is the rhesus macaque, wizened, fierce little creatures whose specific biological similarities to humans make them invaluable to research on AIDS, malaria, vision, tissue transplantation, reproductive biology, and psychobiology. In their large, open compounds at the Yerkes field station, they scamper about, playing on old tires and fire hoses; one compound features a recycled McDonalds playground. Neighboring humans live close enough to see into the monkeys compounds and hear them chattering at night. Other Yerkes primates include pigtail macaques; baboons, used primarily for cardiovascular research; capuchins, whose learned cooperation with one another has revealed much about behaviors like social affiliation and reciprocity; squirrel monkeys, used for studies on drug addiction; sooty mangabeys, used for research on immune function and reproductive biology; and chimpanzees, the subject of non-invasive studies of their cognitive and genetic makeup and social intelligence. All Yerkes animals are either bred by Emory or purchased from licensed breeders specializing in research animals. 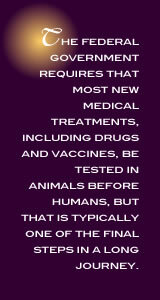 They are cared for by veterinarians, animal care technicians, and enrichment specialists in compliance with the regulations of the Animal Welfare Act and the National Institutes of Health, and the guidelines set forth by the independent Association for the Assessment and Accreditation of Laboratory Animal Care International. Those that are not the subjects of daily, monitored research live much as they would anywhere in captivity: close quarters, lots of company, toys, plentiful food in metal bowls. Although the regulatory measures are both useful and reassuring, Zola says, its the scientists who actually work with these animals who have been at the forefront of the effort to ensure that they are treated as humanely as possible. Zola believes researchers have done themselves a disservice by attempting to downplay the crucial part animals play in scientific advances that already have saved, literally, millions of human lives. Speaking up about their usefulnessand how they are usedwont silence those opposed to animal research, but Zola hopes it will present a more balanced picture to a confused and concerned public. Atlanta has an active animal rights contingent which stages regular protests of Yerkes. The most memorable, in 1997, turned ugly when demonstrators attempted to break into the facility and threw a steel barricade through the window of a squad car. Police resorted to mace and tear gas to subdue the fray. Zola himself was a favorite target of activists in San Diego. Before he even arrived in Atlanta, his new neighborhood was blanketed with leaflets warning his neighbors about his treatment of animals in the name of research. Although Zola will talk at length about his research and his hopes for Yerkes, hell say little about his family, his personal life, his pets. The heated debate over animal research will go on as long as the practice exists. Animal rights activists are passionate and eloquent, organized and well-supported. They claim that using animals for medical experimentation is specist, in the same way discriminating against other races is racist. In addition to their ethical objections, protestors say animal research is bad science that has not directly contributed to human health because animals are biologically too dissimilar. Scientists, though, say they rely on animals to understand the most basic biological processes, from the cellular level up: how the body works, how it deals with illness, and how it responds to treatment. They are able to analyze and manipulate these processes in animals at intricate and systemic levels simply impossible in humans. They proceed from the core belief that human life is to be valued more highly than that of animals, and work toward what they consider a greater good. 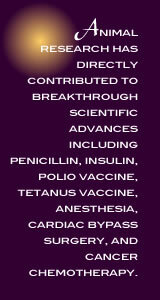 Animal research has directly contributed to breakthrough scientific advances including penicillin, insulin, polio vaccine, tetanus vaccine, anesthesia, cardiac bypass surgery, and cancer chemotherapy. The research taking place at Yerkes right now promises to yield similar richesthe kind of discoveries that alter the landscape of human heath and medical care. Its the misinformation perpetuated by the animal rights movement that keeps him up at night. Zola says he wholeheartedly supports these activists right to publicly state their views, to stage protests, to take reasonable, legal action. He is aware that this is not a debate destined to end in a happy resolution, nor is it a battle he can win. What he can doand what he wishes the opposition would dois fight fair. As he did in San Diego, Zola is working to form a speakers bureau at Yerkes to serve as a public resource for information about the research going on there. He will continue to be an advocate for better communication about science and research. And he will himself continue to be an edifying voiceand a target. Like the work of scientific research itself, he points out, public education is a slow process, demanding patience, hard work, and a commitment to truth.